Are you too lazy to go to the mine to get what you needed to use for the recipe or crafting? Well, just buy it with this mod. 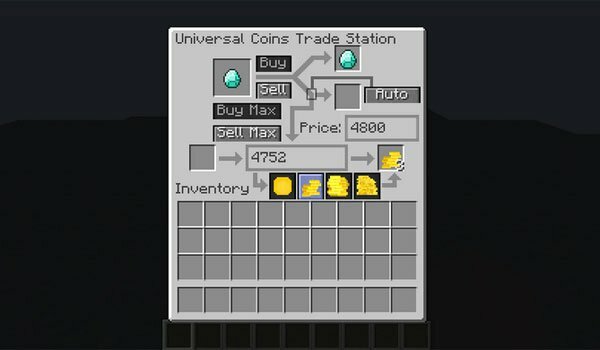 Universal Coins 1.7.2 and 1.7.10 is a mod that adds a “trading station” where you can buy and sell all kinds of objects and resources. So that for example, we can get those blocks that need obsidian without spending several minutes. To buy you need to get coins, to get them you have to sell those items that are expendable for you and accumulate coins to subsequently acquire those items that need. The mod does not contain “jobs”, but you can sell meat once cooked or sell those materials you get from agriculture in Minecraft. How to install Universal Coins Mod for Minecraft 1.7.2 and 1.7.10? A trading comes to your individual items Minecraft!